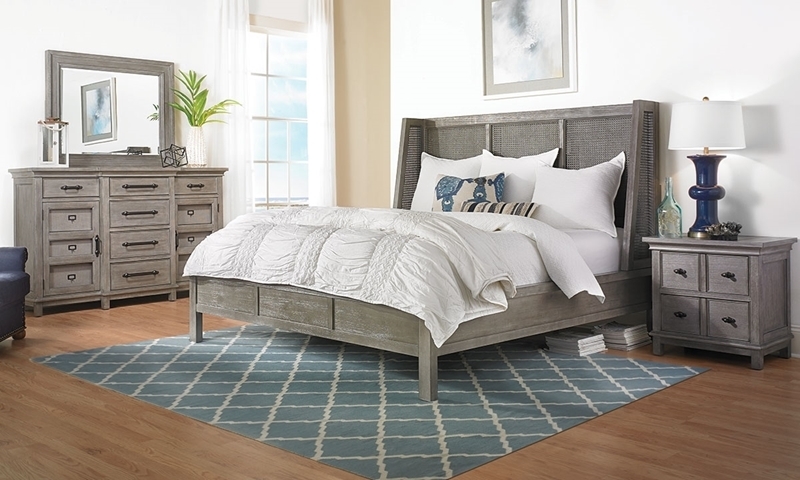 With its pleasing mix of textures in an heirloom gray finish, the River Rock shelter bedroom is the modern, coastal escape that your home needs. A queen shelter bed with woven headboard panels is the focus of the room, its clean, contemporary design coupling nicely with the traditional breakfront silhouette of the group’s dresser. 12 full-extension drawers offer ample space for clothes, accessories and more, while unexpected details like faux cabinet doors over its apothecary-style side drawers with sailcloth fronts add extra depth to the collection. Custom blackened iron handles in a gunmetal finish and a simple landscape mirror complete this unique queen suite.